I can remember growing up and every boy in the neighborhood had Star Wars action figures. At the time, I couldn’t even fathom having my own boys who would become Star Wars fans too. Hasbro has released the Star Wars Vintage Collection in celebration of Star Wars The Empire Strikes Back 30th anniversary. Wow….has it really been 30 years? What is so amazing to me is that Star Wars is just as appealing and popular with boys today as it was 30 years ago. The Star Wars Vintage Collection Action Figures are 3 ¾ inches and come in the classic Kenner packaging from 1978-1984. I received the Clone Commander Cody for this review and I was impressed with the attention to detail for the action figure. Recommended for ages 4 and up these action figures are appealing to boys and even men of all ages. In fact my husband decided he wanted to help “review” the Clone Commander Cody figure and took it away from me to play with the boys. Star Wars Vintage Collection Action Figures Retail for approximately $7.99. 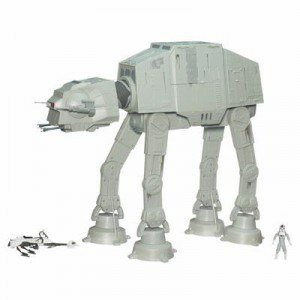 You can view the entire Star Wars Vintage Collection Action Figures and Accessories at Hasbro. Spiderman is very popular with my five year old son. In fact he wore his Spiderman suit for five days straight (even to bed) and only allowed me to take it off to wash it and bring it back to him. 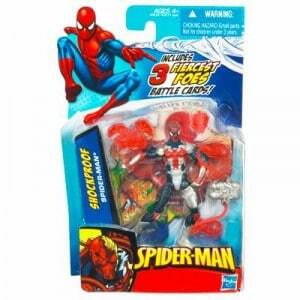 Hasbro also has a line Spiderman 3 ¾ inch action figures and accessories. My son played literally for hours with the Shockproof Spiderman which includes 3 Fiercest Foes Battle Cards. I was surprised how one simple action figure could keep him so entertained. The detail was superb and he really liked the removable armor and helmet. Spiderman Action Figures retail for $6.99. He is planning to ask Santa for the Spiderman Web Jet to go with his new Spiderman Action figure…..a great incentive to make sure he stays good and not naughty until then. Hasbro Action Figures and Accessories make great present for young boys of all ages and collectors too.